....And we're back! I'm refreshed and ready to go after taking the last 2 months off from block drive. It's time to dive back in with the 3rd annual "Oh My Stars!" block drive! 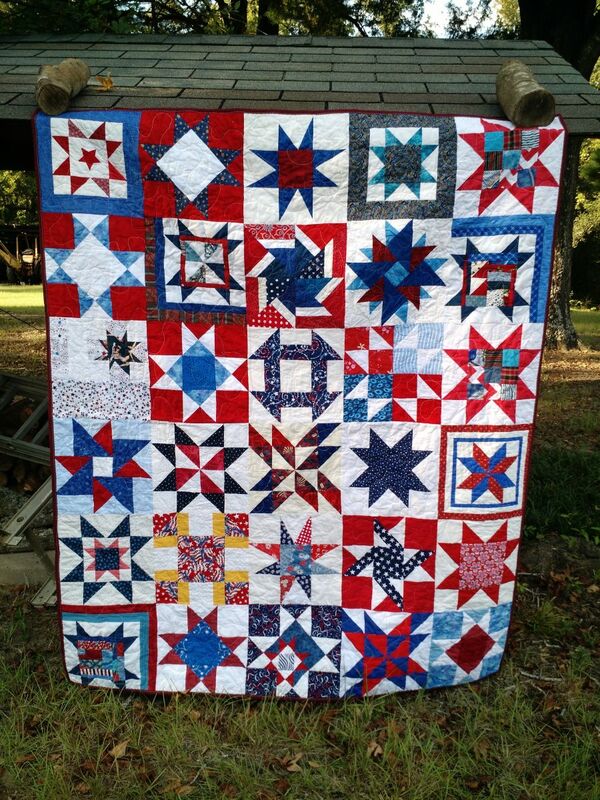 These patriotic star quilts are some of our most popular, which is why I continue to do it year after year. 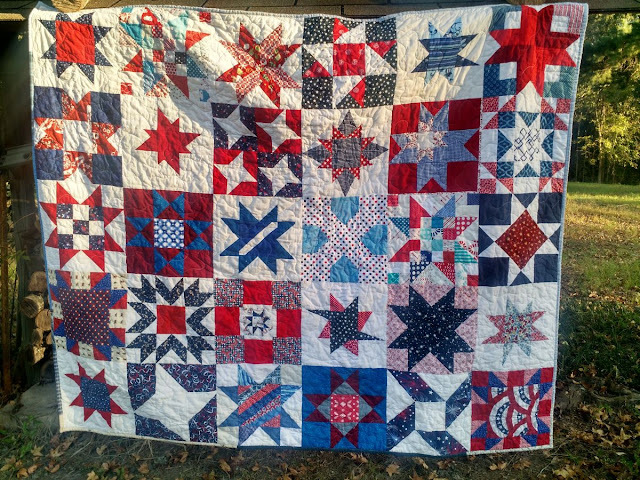 Many of these quilts go to veterans, so they are especially meaningful. 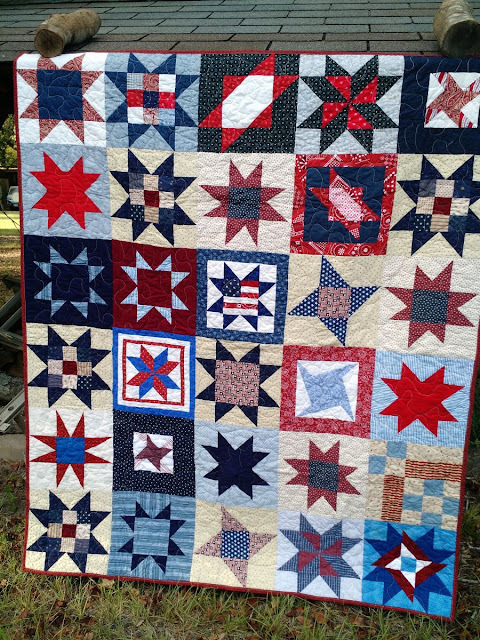 You can look at quilts from the previous drives here and here to get ideas. Also you can check out the original block drive post for a list of some patterns here. Like all of our block drives, these blocks will be made into quilts to benefit "Covered in Love" which gives quilts to patients dying in the hospital. Families get to take these quilts home to help them mourn and remember their loved one. Anyone can participate and make as few or as many blocks as you like. Email CoveredinLoveTx@gmail.com or comment (make sure you aren't a "noreply" blogger) for the address. Covered in Love is a 501(c)3 charity, so if you would like a tax receipt just let me know. The two block drives so far this year produced enough blocks for 47 quilts! They aren't all done yet, but well on the way. I'm excited to see what we will make together this time! BTW... there's a fix for the Blogger comments now. Oh what fun! I think I started doing these with you last year with the RW&B blocks. Enjoyed them so much I made duplicates for me! Love star blocks. Time for some paper piecing too. So excited to have a new project on top of all my others! First, I will go through my blocks and see if I have anything that will work for this drive, and then I will make what I can Thanks! Here we go again with some of my favorites....stars & red, white & blue! I'll start looking for some unique star patterns & pulling my fabrics. Seems like just a few months ago we were making these for you. I love it when time flies. I am excited about the star blocks again! Getting fabrics pulled to make some patriotic blocks. Red, white, and blue is always fun to work with. 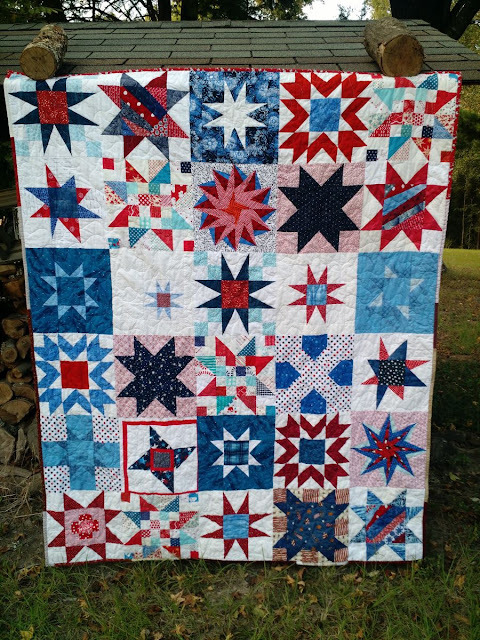 The star quilt tops look great. Love making stars and so happy to be involved...thank you! I just discovered this group on my Facebook page. I would love to get involved. What a great ministry. Please send your address as I have some blocks to send. Thanks!